When President Michael D Higgins visited the Rinn Gaeltacht a few weeks ago he made a simple request of the Irish people: “Déanaimis iarracht níos mó ar son na Gaeilge”. This request seems all the more current in light of Dr Conchúr Ó Giollagáin’s update to the Comprehensive Linguistic Study on the Usage of Irish in the Gaeltacht: 2006-2011. The conclusions of the report, which warns of the potential end of the widespread use of Irish as a community language in the Gaeltacht, the delays accompanying the publication of the report and the lack of Government engagement with this issue have been controversial. Reports on the Irish language tend to focus on its core place in our education system, the translation of documents or its ceremonial use by foreign dignitaries. The situation in our Gaeltachtaí, where Irish has been the language of the community for more than two millenniums is rarely given serious attention, probably because the phenomena putting pressure on Irish as a community language are so little understood. Few question the value to our country’s sense of itself of that language which is uniquely ours, the necessity of its continuity as a community language or the need for urgent action if any part of that heritage were endangered. We should view Dr Ó Giollagáin’s report as a call to action. 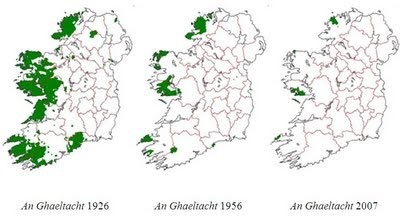 If we act decisively, Irish can thrive as a community language inside and outside the Gaeltacht. The Government and the State must show leadership by not only demonstrating to the Gaeltacht community that they fully support the continuing existence of a strong sustainable Gaeltacht, but that this is a priority. There can be no suspicion that the State has surrendered to an attitude of managed decline, believing the Gaeltacht to be little more than a quaint heritage destination where the clearest marker of our distinctiveness as a culture is spoken as a form of recreation. Gaeltacht communities must be empowered to be more than that, to be communities with a future in control of their destinies. First, a Gaeltacht education policy that ensures our education system facilitates native speakers. Minister for Education and Skills Jan O’Sullivan has shown some understanding of the challenges and a consultation on education in the Gaeltacht is under way. A good beginning for the department would be to stop posting teachers who are not fluent in Irish to Gaeltacht schools. Second, adequate funding for Údarás na Gaeltachta and the new community language planning system in the Gaeltacht. Údarás, which is tasked with facilitating economic development in Gaeltacht areas, had its funding cut disproportionately during the crash. It is trying to operate at less than 20 per cent of its 2007 budget, while bodies such as the IDA and Enterprise Ireland have had funding restored to 2007 levels. Údarás will fulfil its potential to generate investment in the Gaeltacht (enabling native speakers to remain there) only when its staff are given the resources to do the job. Third, substantially increased support for Gaeltacht groups that empower their members to use their native language and develop their communities. Play groups, child-minding facilities and social events in Irish organised by local groups such as Tuismitheoirí na Gaeltachta in Connamara and in Donegal have been very successful. They deserve recognition for their Trojan efforts and other areas should be encouraged to follow their excellent example. Dr Ó Giollagáin’s report also reveals glimmers of light that prove we can rejuvenate Irish as a community language. Something positive is happening in the Béal Átha an Ghaorthaidh, Cléire, Cúil Aodha and Rinn Gaeltachtaí, where the number of daily speakers in the community rose 14 per cent, 10 per cent, 6 per cent and 5 per cent respectively between 2007 and 2011. Let’s find out what is different there and see if we can use those lessons to achieve a positive difference in other Gaeltacht areas. It is a challenge, yes, but our prospects of success are good if these proposals are implemented. We at Conradh na Gaeilge are willing to work with any individual, community or State group interested in taking on this challenge together. President Michael D Higgins has shown the way by asking us to do more for the Irish language, let us follow his lead.